In a week with no shortage of potential market catalysts, the latest US-China trade summit still figures to play a role in shaping market direction, at least in the short term. Maybe more than once, actually. Unfortunately, the optimism lasted all of one trading session, because the next day brought President Trump’s “Tariff Man” tweet and a -3.2% SPX sell-off. The market has yet to climb back to the December 3 high. This is not to say the rug getting pulled out from under a positive trade development was solely responsible for the market’s brutal December. But it also wasn’t the first time the market lost its footing because of a quickly reversing storyline in the trade war saga. Over the past several months, traders have grown accustomed to good or bad trade news being followed in short order by, more or less, its polar opposite. While it’s a frustrating state of affairs for investors who simply want a seemingly bearish obstacle cleared from the road, one lesson may be to take initial reports on trade negotiations with a grain (or five-pound bag) of salt. Although at some point a workable, long-lasting deal is likely to be struck—and who knows, that could even be this week—the back-and-forth of the past several months still represents a status quo that has yet to be disrupted: Good trade headlines have often been followed by short-lived stock market up moves (e.g., January 18), and bad ones are sometimes followed by short-lived down moves (e.g., January 24). 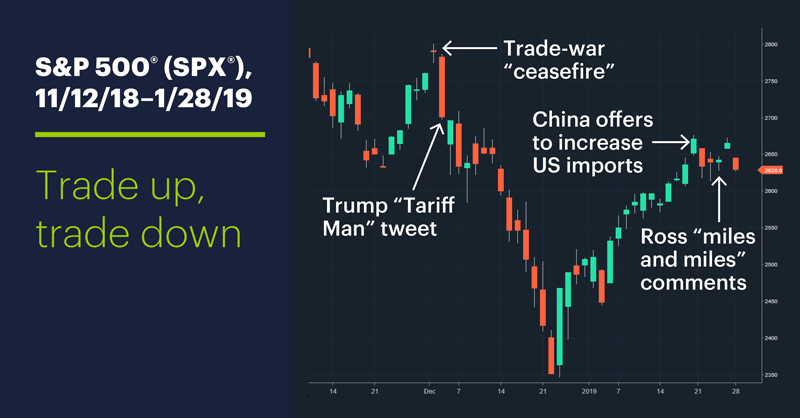 In other words, the initial market reaction to the news doesn’t always stick, which can present opportunities for adept short-term traders who don’t expect the most recent trade-war story to be the last. Again, there’s never just one thing driving the market, but at certain times certain stories can gain an upper hand in the market consciousness and trigger disproportional optimism or negativity. For better or worse, the US-China trade situation is one of those stories. Market Mover Update: Earnings misses by Caterpillar (CAT) and Nvidia (NVDA) before the open helped put the market behind the eight ball yesterday. Oil followed suit: March crude futures (CLH9) had their biggest down day of the year yesterday, falling more than 4% intraday. British pound futures pulled back modestly yesterday ahead of today’s Brexit vote in the UK Parliament. Today’s numbers (all times ET): FOMC Meeting starts, International Trade in Goods (8:30 a.m.), Retail Inventories (8:30 a.m.), Wholesale Inventories (8:30 a.m.), S&P Corelogic Case-Shiller HPI (9 a.m.), Consumer Confidence (10 a.m.), UK Parliament votes on second Brexit Plan. Today’s earnings include: 3M (MMM), Allergan (AGN), Biogen (BIIB), First Bancorp (FBP), L3 Technologies (LLL), Lockheed Martin (LMT), Pfizer (PFE), Rockwell Automation (ROK), Verizon (VZ), Xerox (XRX), Advanced Micro (AMD), Amgen (AMGN), Apple (AAPL), eBay (EBAY), Juniper Networks (JNPR). 1 South China Morning Post. US and China reach 90-day trade tariff ceasefire after China agrees to buy ‘very substantial’ amount of American goods. 1/18/19. 2 CNBC.com. Commerce Secretary Wilbur Ross: The US is still ‘miles and miles’ from a trade deal with China. 1/24/19.